Thelma Martha Fragstein, 82, of Nederland, and former long-time resident of Orange, died Wednesday, January 30, 2019, at The Medical Center of Southeast Texas, Port Arthur. She was born January 18, 1937, in Sledge, Mississippi, to Lucy Elsie Prestage and Leslie Howard Prestage. Thelma was an astute business woman. She was the owner of Lady Fair Beauty Salon for fifteen years. 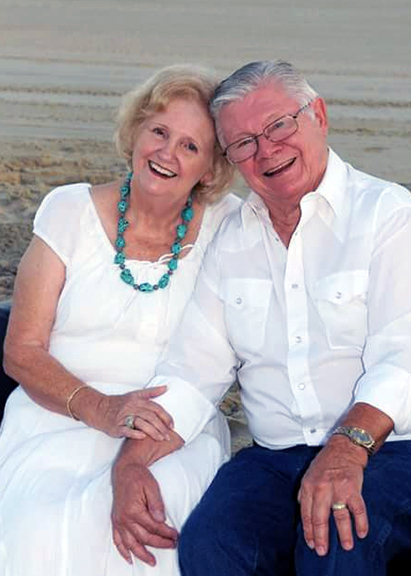 In 1982, she and her husband, Karl, opened Karltex Machine, Inc. in Orange. She was a very good seamstress and made clothes for all her kids. She was smart as a whip and learned to cook, and speak, read, and write German when she moved to Germany. She is survived by her husband, Karl-Heinz Fragstein; children, Carolyn Huber; Karl Gunther Fragstein and wife, Lucy; Siegfried Fragstein and wife, Sheila; and Kimberly Wehmeyer and husband, Keith. She leaves nine grandchildren; thirteen great-grandchildren; and her sister, Kay Robin. She is preceded in death by her parents, Lucy and L. H. Howard; and son-in-law, Dr. Tighe Huber. A gathering of Mrs. Fragstein’s family and friends will be from 6:00 p.m. to 8:00 p.m., Friday, February 1, 2019, at Broussard’s, 505 North 12th Street, Nederland. Her funeral service will be 1:00 p.m., Saturday, February 2, 2019, at Broussard’s, her entombment will follow at Oak Bluff Memorial Park, Port Neches. Memorial contributions may be made to the Tighe A. Huber Scholarship in Premedical Studies to be established through Lamar University, P.O. Box 11500, Beaumont, Texas, 77710 or online at www.lamar.edu/give. For assistance, please call 409 880-2117. Thelma was such a bright spirit. My thoughts and prayers are with the family. Thelma and I graduated from PNG in 1955. She was a sweet friend.... everybody loved her. May God comfort her family. RIP Thelma. Her beaming smile and joyful laughter brought true sunshine to the lives of everyone who had the blessing of knowing her! She was a truly remarkable woman! Her tenacity of spirit, yet compassionate, loving heart touched many lives along her journey through life. Our love and prayers are with all of you! May God bless All of you and May He wrap you in His loving arms of comfort and peace during these difficult days. May your many precious memories of your Momma and Grandmother bring you Joy and Happiness in the days to come. Dear Seigfried, when I saw your mother's name i had to see if you were one of her children. We were in 5th grade together in Mr. Noel's class at Langham Elementary. I never knew what happened to you, but have thought about you over the years. I am so sorry for your loss. Your mom sounds like she was a wonderful lady. God bless you and you're family, Vande (Gilchrist) Derrick.